Ladies light purple handkerchief with embroidered name of your choice featuring an angelic golden halo overhead. 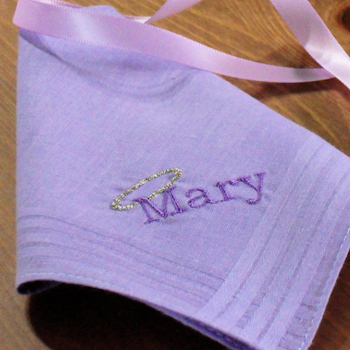 Ladies light purple handkerchief with embroidered name of your choice featuring an angelic golden halo overhead. Select from one single handkerchief or a gift set of 3 hankies. Just fill in the option box with a name or initials and choose what letter font style you want the name sewn in. Ladies light purple handkerchief with embroidered name of your choice featuring an angelic golden halo overhead. Select from one single handkerchief or a gift set of 3 hankies. Just fill in the option box with a name or initials and choose what letter font style you want the name sewn in. The size of handkerchief is a ladies 28cm size, classic light purple cotton. (Childrens and ladies hankies are the same size.) Makes lovely little gift for a variety of occasions.